FRICS, is a Principal at Bard Consulting. Bard Consulting provides strategic real estate solutions to institutional investors both domestically and internationally. Chris has a Bachelor of Science from Babson College and a Juris Doctor from Golden Gate University. has 30 years of experience in both public and private real estate investing. His background is in both research and public real estate and includes a six-year tenure as the portfolio manager for a global REIT fund. In 2013, Mr. McGowan won the Lipper Award for Best Performing International Real Estate Fund. He has a degree in economics from the University of California – Berkeley. Institutional investors are increasingly considering investing in a dynamic new property sector – data centers. Whether viewed as a subset of their industrial or office property allocations, or as new specialty property type, data centers investments can offer an attractive way to participate in the rapid growth of technology. This article starts with an overview of the market for data center space in the major metropolitan areas of the United States and Canada. We next examine supply and demand trends for data center space, and the industries and users that are driving demand. Capital market conditions are then discussed, and we conclude with our thoughts on functional obsolescence and other risks posed by investing in this asset type. Data center facilities can vary greatly in their physical attributes, functionality, and economics. Most types of data centers can be leased on either a single-tenant basis or to multiple tenants, if the building has been designed to accommodate more than one user. Complicated infrastructure requirements (notably power generation and distribution, cooling and fire suppression, and enhanced security) make the construction of multi-tenant data centers, or the adaptation of existing buildings into multi-tenant facilities, a very difficult and costly undertaking. Entire data centers are often leased or owned by large “enterprise” users that need a secure facility entirely for their own use. There are a wide-array of companies that lease such facilities, including internet-based providers of technology, social media or gaming, healthcare service providers, life insurance and other financial service companies, government or educational institutions, as well as telecommunications and other information technology firms. A typical enterprise-level data center might have 5 MW of power. Properties that provide data center services to multiple users include “colocation facilities”, which can lease space as small as the individual cabinet or rack within a data center room. Some facilities offer wholesale colocation, which CBRE Research defines as offering demised suites that each have greater than 250 kW of IT power. Other data centers provide retail colocation, in which space within a data center is shared by smaller users (often divided into cages and cabinets, or divided racks). Retail colocation centers can also provide the use of other IT hardware or software and services, on a fee or contractual basis. Four common types of data centers are described below: (i) base building, (ii) powered base building, (iii) turnkey, and (iv) internet gateway. A “base building” data center is essentially an improved industrial or office building which is leased to a data center operator that incorporates its own specialized improvements. The base building needs to have certain physical attributes that are not common to all office or industrial buildings, such as above-standard load-bearing floors, greater ceiling heights, proximity to ample electrical power supplies, and connectivity to fiber, cable and other telecommunication networks. Rental terms for a base building data center are usually at the lower-end of the data center spectrum, as the tenant directly bears the largest portion of costs. In the case of a base building data center lease, the tenant is responsible for upgrading the facility with extensive capital improvements, which generally will include additional power generation facilities, backup generators and batteries, extensive and sophisticated cooling, ventilation, and fire suppression systems, telecommunication switching gear, extensive arrays of racks and servers, and enhanced security features. It is not uncommon for the improvements paid for by the tenant to cost the same or more than the base building, depending on the size and scope of the data center. For example, a private real estate investment manager detailed to the authors a series of transactions in which a major cloud-based data center tenant spent approximately $30 million to build out its data center improvements in each of six data centers that the manager had purchased. These improvements cost approximately $187 per square foot, as compared to the $154 per square foot that was paid for the base buildings. Most leases contain provisions that, upon lease termination or bankruptcy, these costly improvements either revert to the ownership of the landlord, or must be removed at the tenant’s cost. Tenants are often protected by long lease terms and/or guaranteed renewal options, which may contain only minimal annual lease escalations. A hybrid type of data center lease is for a “powered base building”, which is a base building for which the landlord has installed the necessary primary power upgrades as part of its investment. Such a facility is usually described by its power capacity in terms of kilowatts (kW) or megawatts (MW). Typical data centers range from roughly 2 MW to 15 MW. However, some new “hyperscale” facilities built for users like Google, Amazon, Facebook, or Microsoft can offer over 100 MW of power. Note that most data centers are not particularly large in terms of square footage. Based upon our examination of the property holdings of several large data center REITs, they often range from only 50,000 to 100,000 square feet. Real Estate Investments Trusts (REITs) that invest in data centers are described in more detail later in this piece. A “turnkey” data center is a property for which the landlord has borne the cost of most or all the many improvements outlined above. The rental rate paid by the tenant is much higher in this case, as the landlord has borne the costs and risks associated with the infrastructure upgrades. There is a very wide range of costs, as no data centers are exactly alike. For example, while the construction cost of powered base buildings may range from $200 to $450 per square foot, turnkey data centers are reported to cost from $800 to $1,200 per square foot, or more, to build. Turnkey data centers could pose a higher level of risk to institutional investors than powered base buildings, as the specialized improvements have a higher risk of functional obsolescence. “Internet gateway” data centers differ greatly from the typical data centers. Also known as “carrier hotels”, these properties are single buildings that are served by multiple fiber providers. Space within internet gateway data centers is often leased to retail colocation providers. Since their introduction in the 1990s, data centers have most frequently been located close to existing fiber, cable, or other telecommunication lines that their tenants or owners needed to access. Today, most of the internet’s traffic flows through fiber optic lines due to their ability to offer the greatest speeds and bandwidth. Historically, many of the predecessor cable lines were located within railway easements in the United States, while undersea cable had entry nodes in a handful of coastal cities. The confluence of transcontinental and regional fiber lines and cable entry points to large centers of technology and business resulted in areas such as Northern Virginia, New York/New Jersey, and Northern California being chosen as the sites for much of the data center industry’s early growth. Another important factor in the early growth of data center hubs was the formation of Network Access Points (NAPs) in the 1990s. Internet service providers connected with each other through the NAPs to form a public network exchange. The first four NAPs were located in (i) Northern Virginia (called MAE-East), (ii) Northern New Jersey, (iii) Chicago, Illinois, and (iv) San Jose, California (MAE-West). At one point, approximately 70% of global internet traffic was thought to pass through MAE-East. Over time, many additional exchanges were added in markets throughout the country. While the four NAPS are still very important, they are now part of a wider number of Internet exchanges points, or IXPs, that allow networks to connect directly. Proximity to IXPs remain an important draw to data center users. Availability and pricing of reliable electrical power. Proximity to multiple providers of fiber optic services (measured by “latency” – the time delay in transmission). Extensive fiber lines from multiple providers provides redundancy, low latency, and better pricing. Proximity to large customers, such as technology, financial services, media and entertainment, and healthcare companies, as well as government and educational users. Proximity to human population clusters. With the rise of consumer internet use, reducing the latency of streaming services means being closer to human population clusters is also an important factor. Estimates of the size of the data center market vary greatly. Some reports indicate that there are over 3 million data centers in the United States – but figures on this scale include the server rooms that have traditionally been operated by internal IT teams within office space leased or owned by a given company. Our report focuses on purpose-built data center buildings that are owned or operated by professional data center operators. Unlike traditional real estate sectors, which usually measure the existing inventory of buildings in terms of either physical size or leasable area, the discussion of data centers focuses more commonly on electrical power supply available. This is measured in megawatts (MW), or, for smaller buildings and individual suites or leases, kilowatts (kW). The existing inventory of the most important data center markets in the United States and Canada is shown in Exhibit A. These markets, combined, represent existing inventory of powered data center space of 4.6 gigawatts, which is equal to 4,624 MW. This data comprises most of the total data center market in major metropolitan areas of the United States and Canada; it does not capture many of the large datacenters built by firms like Apple and Google in rural locations. Exhibit A also provides information on metropolitan vacancy rates and recent levels of demand (net absorption), which is discussed below. (1) Investory, vacancy, and net absorption figures are quotes in megawatts (MW). (2) Chicago inventory is as of year-end 2016. 1. Northern Virginia is perhaps the leading location for data centers. It is by far the largest market, as measured by installed IT power, at 853 MW as of mid-year 2017 (see Exhibit A). The market gained early prominence due to the US Government’s use of fiber optic networks as early as the 1960s, as well as the need for government-related entities or contractors to store their data securely. As the location of the most important NAP (discussed above), Northern Virginia became home to many of the early telecom and internet service providers, including AOL, UUNet, and MCI. Several locations in Northern Virginia have been broadly supportive of working with the industry to provide the power needed for large scale data center construction; notably cities within Loudon County and Prince George County, as well as the city of Manassas. This supportive environment, however, leads Northern Virginia to have the highest absolute level of total new supply underway or planned, as discussed further below. Another factor that boosts Northern Virginia’s attractiveness to data center users is that it offers attractive economics versus other coastal data center markets. Exhibit B provides a study by metropolitan area of average rental rates (which are paid to the landlord) and average power costs (which are paid to the local utility company). We present this information to give the reader an idea of the relative costs of running a data center in various metropolitan areas. Northern Virginia ranks very favorably on both metrics. 2. Chicago is North America’s second largest data center market, with over 500 MW of existing inventory. It is a favored network hub location due to (i) its early status as the site of the Chicago NAP, (ii) its central location in the US, (iii) the proximity it has too many large corporate users, (iii) the availability of ample land in its far-reaching suburbs, and (iv) attractively-priced power. 3. Dallas/Ft. Worth ranks as the third-largest North American data center market, with 458 MW. Although not home to one of the four original NAPs, the northeast Dallas suburb of Richardson has a long history of technology, as it is the headquarters of Texas Instruments. The availability of land, low cost power, and a central location are important drivers of demand. 4. Northern California is home to one of the world’s largest clusters of high technology companies, so it is not a surprise that it features among the largest data center markets, with 424 MW. Home to MAE-West, one of the original NAPS, in San Jose, the market must overcome hurdles such as expensive rents, high power costs, and older space inventory, and a lack of readily available land. But many of the tech giants located nearby are willing to pay the price for access to a nearby data center. 5. The Pacific Northwest market includes Seattle, Portland and also rural locations such as Quincy, a small town dominated by large data centers. Together, these areas have an existing inventory of 350 MW. Urban data centers in Seattle have long been attractive to local tech firms like Microsoft and Amazon, but the availability of cheaper power and lower construction costs have boosted large-scale data center developments in rural areas as well. 6. New Jersey is the sixth-largest data center market in North American, with 327 MW. User demand in the market has historically been driven by the large New York-based banks and financial services firms – especially those that sought disaster-recovery and back-up facilities within reach of their employees but far enough away to provide a degree of separation. Most of the inventory is situated in former industrial buildings in the northern New Jersey cities close to Manhattan, although Pennsauken (home to one of the four original NAPs), is actually a suburb of Philadelphia. (1) Rental rate ranges for smaller power requirements are presented on an “all-in” basis, except those denoted “+E”, which are “plus electricity”. (2) Rental rate ranges for larger power requirements are presented on an “plus electricity” basis, unless noted otherwise. (3) Power rates are presented in cents per kilowatt hour (cents/kWh). Apple purchased 183 acres in Maiden, North Carolina, where it has constructed a 505,000 square foot data center and has plans to start a matching facility; costs at full build of the campus may reach $1 billion. Facebook is starting a fourth data center in Altoona, Iowa; this will bring the size of a campus it is constructing to 2.5 million square feet. Both Apple and Facebook have large data centers in Prineville, Oregon (population 3,500). Facebook has completed two data centers in Prineville and is starting a third; it has reportedly spent over $800 million on construction of these facilities since 2010. In August 2017, Apple announced it may spend as much as $1.4 billion to build a new data center campus in Waukee, Iowa. State and local authorities have approved $208 million in tax breaks in an attempt to lure Apple. Wind-generated power also helps keep costs low, and Iowa is viewed as having relatively few natural disasters that could interfere with data center operations. Apple joins Facebook and Microsoft in choosing to locate hyperscale data centers in the greater Des Moines area. The increasing adoption of cloud-based services across many segments of business and personal life has fueled a boom in demand for the services provided by data centers. Most of the information or data passing through the internet originates or terminates at a data center – and is termed “traffic”. A widely cited white paper published in late 2016, the Cisco Global Cloud Index Forecast and Methodology 2015-2020, projects that global data center-IP (internet) traffic will grow from 4.7 zettabytes per year in 2015 to 15.3 zettabytes in 2020 – a 27% compounded annual growth rate. For perspective, some high-end desktop computers offer one terabyte hard drives; a zettabyte equals one billion terabytes! Cisco’s study also projects that more and more data will transition to the cloud. 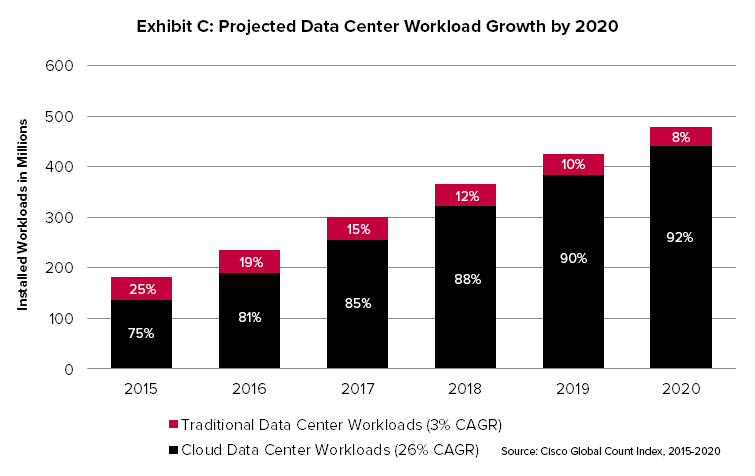 In fact, it expects that global cloud traffic will represent 92% of all data center workloads by 2020, as shown in Exhibit C.
Relatively new technologies that are not yet widely adapted are expected to generate vast amounts of data on a daily basis. These technologies include self-driving vehicles, the internet-of-things (IoT), and other so-called “smart” devices, machines, and buildings. While not all of this daily data needs to be stored, it is expected to generate much of the growth in data center traffic in coming years. JLL has analyzed demand patterns based on actual net absorption of data center space. During the first six months of 2017, cloud-based users accounted for the largest share of leasing activity in 12 of the 17 most important data center markets in North America. In addition to cloud users, other industries that accounted for high proportion of demand included technology firms, entertainment and media companies, financial services, healthcare, and telecom. Demand for data centers has fueled high levels of net absorption. During 2016, a total of 396 MW of data center space was absorbed, in one of the most active leasing years on record. This is relatively high rate of net absorption, relative to the current inventory of about 4,624 MW. See Exhibit A, above, for details on net absorption by major metropolitan area. Trends driving the signing of new leases (or construction of new user facilities) include the ongoing business consolidation of the data center users (both tenants and owners) and the consolidation of individual users looking to move from smaller to larger data centers. 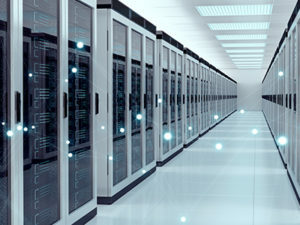 Additionally, many corporate or “enterprise” users have been moving their data center operations – relocating from self-owned data centers into professionally-managed colocation facilities or third-party cloud data centers. During 2016, large users such as Amazon Web Services (AWS), Google, Microsoft Azure, and Oracle took massive amounts of space in markets across the country. Many of these facilities are what is termed “hyperscale data centers”, which are large, scalable data centers that offer cloud services to other businesses – that is, they offer “public cloud” hosting. Cisco identifies 24 hyperscale cloud operators, including companies like Apple, Amazon, Facebook, Microsoft, Google, Yahoo, eBay, Alibaba, Salesforce, and ADP. This group operated 259 hyperscale data centers at year-end 2015, which represented 21% of installed data centers worldwide. Cisco predicts that hyperscale data centers will continue to see rapid growth and will control 86% of public cloud workloads by 2020. See Exhibit D for Cisco’s hyperscale projections. The high level of tenant activity seen in 2016 continued during the first six months of 2017, with another 218 MW of space absorbed. JLL expects that strong demand will continue, but that it may soften for a period as these large spaces requirements are absorbed and utilized. Robust levels of new data center construction are underway across North America, in response to very healthy levels of demand during 2016 and expectations for continued robust growth. As of June 30, 2017, there was 535 MW of data center currently under construction within the 17 North American data center markets tracked by JLL, as shown in Exhibit E. Another 1,123 MW of data centers was planned in these markets. In total, 1.658 gigawatts of potential new supply were either under construction or planned, representing 36% of the existing inventory. (1) Metropolitan areas are ranked by Total Supply as Percent of Inventory. (2) Inventory, vacancy, and net absorption figures are quoted in megawatts (MW). (3) Planned construction is often a volatile data set because of its speculative nature. The largest level of potential new supply is in Northern Virginia, where 190 MW of space is underway, and another 172 MW is planned. Northern Virginia is the largest data center market in North America and is an important base for hyperscale cloud providers such as AWS and Microsoft. Nonetheless, this level of future supply could pose some risks to the market, as it represents a potential increase of 42% in the existing inventory of 853 MW. On a relative basis (comparing the total of new construction underway and planned construction to existing inventory) very high levels of new supply are also seen in Houston, Austin, San Antonio, Phoenix and Nevada. Other areas with high levels of new supply, but on a larger existing base, are Dallas/Ft. Worth and New Jersey. Metropolitan areas in California, the Pacific Northwest, and Boston, on the other hand, are expected to see relatively low levels of total new supply. This is not wholly unexpected, given traditional difficulties in building office or industrial space in these areas. However, it is surprising to see Atlanta included in this group. In recent years, two forces have dominated the transaction market for data centers: (i) the growth of data center real estate investment trust (REITs), and (ii) corporate merger and acquisition activity. These forces are intertwined, as many of the mergers have also involved REITs. Equinix (NYSE: EQIX, $36.1 billion market capitalization) is the world’s largest provider of data center space and services. It only owned 31% of its 179 data centers, as of March 31, 2017, – the rest being retail data centers it operates as a tenant, under colocation or interconnection business models. In fact, Equinix is one of the largest tenants of Digital Realty Trust (which is described below). Digital Realty Trust (NYSE: DLR, $25.0 billion market capitalization) owned 145 properties (mostly data centers) totaling 23.4 million square feet, as of June 30, 2017. Digital became a public REIT in November 2004 and has grown rapidly through acquisition of individual data centers, the construction of speculative and build-to-suit data centers, and by buying other data center operators. Digital historically had a focus on wholesale data center operations, but in recent years it boosted its colocation facilities, notably through the addition of Telx’s properties. Digital recently completed a merger with what was another large data center REIT, DuPont Fabros Technology, Inc. Prior to the merger, DuPont Fabros owned only 12 data centers, but they are large scale facilities, with a total of 305 MW, and a concentration of facilities in Northern Virginia. Post-merger, Digital now owns 88% of its 157 global data centers. Digital has 13 active development projects underway, including projects in Northern Virginia, Dallas/Ft. Worth, Miami, Northern California, and several international locations, in addition to five development projects it gained from the merger. Switch, Inc. (NYSE: SWCH, $9.1 billion market capitalization). Switch is the most recent example of a data center developer deciding to go public and utilizing a REIT structure. Switch was founded in 2000, but completed its initial public offering (IPO) in October 2017. Switch and its founder, Rob Roy, hold more than 350 patents relating to data center design and construction, and claim to have the world’s most advanced data centers, which they call “Tier 5”. Switch started with its Core Campus in Las Vegas, which comprises two million square feet and offers 315 MW of power. Its Reno-area Citadel Campus is planned to encompass eight data center buildings totaling 7.3 million SF and offering 650 MW in total. This campus is expected to be the largest data center, globally, upon completion of build-out, and offers connections to the more-expensive Northern California market. Switch is planning similar large facilities in Georgia and Michigan. CyrusOne, Inc. (NYSE: CONE, $5.6 billion market capitalization). CyrusOne operates 35 data centers globally, with the majority of its revenues derived from data centers in Dallas/Ft. Worth, Houston, Northern Virginia, Cincinnati, and Phoenix. It also has 88 MW of new developments underway in Northern Virginia, San Antonio, Chicago, and Phoenix. It recently closed on two large land purchases for future developments: 48 acres in Quincy, Washington and 66 acres in the Dallas/Ft. Worth metropolitan area. CoreSite Realty (NYSE: COR, $3.8 billion market capitalization) was initially formed in 2001 as CRG West, a portfolio formed by Carlyle Group. It became a public company in 2010, and Carlyle Group remains its largest shareholder. CoreSite’s portfolio of data centers is dominated by carrier hotels and other interconnection facilities, although it also offers wholesale data center space. CoreSite owns 20 data centers in eight markets, containing 2.0 million square feet of data center space. Most of these assets are in Northern California, Northern Virginia, Los Angeles, New Jersey/New York, Chicago, Denver, and Boston. Its current development activity is limited to a few small expansions in these markets. QTS Realty Trust (NYSE: QTS, $2.6 billion market capitalization) started purchasing data centers in 2003 and became a public REIT in 2013. It is now a fast-growing provider of custom data centers, colocation facilities, and managed cloud services. It owns 92% of the space in the 25 data centers it operates globally, that together provide over 600 MW of power capacity. QTS derives the majority of its revenues from data centers in Atlanta, Dallas/Ft. Worth, New Jersey, and Northern California. It recently completed a large data center in Chicago that can offer 55 MW at full build-out. QTS is an active developer, with projects underway in Atlanta, Chicago, Dallas/Ft. Worth, Northern California, and New York during 2017. The most active buyers of data centers have historically included the large data center REITs described above, as well as private data center operators, private equity firms, private REITs, and a few traditional private real estate managers. Cushman & Wakefield provides an excellent log of data center transaction activity. Since January 2016, it tracks 30 data center transactions, including mergers and acquisitions (i.e. the Digital Realty and DuPont Fabros merger) and other large portfolio deals. Interestingly, there were no deals on Cushman’s list from traditional private real estate managers. The public REITs completed six of the 30 transactions on Cushman’s list. Other notable buyers were privately-held owner/operators of data centers like TierPoint, H5 Data Centers, AiNet, Neutrality Properties, and Zayo. This group completed seven of the 30 transactions. Active private equity investors include GI Partners, Digital Bridge, and ICONIQ. Digital Bridge acquired data center owner/operator DataBank in 2016, as well as Vantage Data Centers in May 2017. As part of the Vantage acquisition, Digital Bridge acquired Vantage through a joint venture with Canada’s PSP Investments and the general account of TIAA, and brought on Mike Foust (the co-founder of GI Partners and the previous CEO of Digital Realty), to join Vantage’s board. Another notably active investor was Carter Validus, which is a private REIT. It completed three smaller single-asset acquisitions in secondary/tertiary markets and two larger deals. Investors in data centers have been concerned over the risk of functional obsolescence since the sector first attracted their interest in the late 1990s. Hyperscale cloud users and providers (e.g., AWS, Microsoft, and Google) have tremendous scale and capital resources; they will continue to invest these resources in order to further revolutionize the relatively nascent data center industry. Researchers are actively using artificial intelligence (AI) to develop ways to improve data processing, storage, and retrieval, while the growth of High Performance Computing (HPC) services may reduce the need for some data center traffic related to “big data”. As an example of potential obsolescence, JLL’s 1H17 Data Center Outlook published an excerpt of an interview with a global big data firm, which stated that “major heat changes from newer processors will drive us to shutdown data centers that are not at least 200 watts per square foot”. While this is just the experience of one very large data center user, it does point to a degree of risk, given that many data centers built in the last decade provided between 125 and 200 watts per square foot of power. Generally speaking, private real estate investment managers we interviewed attempt to mitigate these short- to medium-term risks through requirements for longer-term leases to high quality tenants. In many cases, the specialized improvements are owned and installed by the tenants, such as the base building data centers or powered base buildings. Many of the specialized features that would most likely be subject, over time, to higher levels of functional obsolescence are the responsibility of the tenants, who often upgrade or replace them not only in order to stay competitive with their industry peers but because their proper and uninterrupted operation is critical to their business. However, specialized improvements within “turnkey” data centers could be subject to higher degrees of obsolescence risk for the landlord. Longer term, risk lies in the potential for the development of completely new and “disruptive” technologies. Work is underway on “post-silicon” technologies that could completely alter the fundamental design and functionality of data centers. For example, University of Washington and Microsoft researchers have successfully developed techniques to store and retrieve digital data using DNA molecules. While the current process is slow, data can be stored with densities millions of times greater than current technology, and with significantly longer storage lives. Other technologies under exploration are not so radical, but could possibly also bring about significant changes to how and where data centers are built. For several years, various teams of researchers from Google and Microsoft have been experimenting with both underwater or floating data centers. These remotely-operated pods would be much easier to keep cool than traditional data servers, and could be mass produced. There are many practical hurdles to overcome, but an added benefit is that about 40% of the world’s population lives within 100 kilometers of a coastline, according to the United Nations. Future innovations in power generation and distribution, cooling systems, data storage and transmittal, and other technologies may impair the functionality, over time, of some existing, older, data centers. Investors should carefully monitor the quality and specifications of data centers that they plan to acquire in order to limit the risks that may accrue by, for example, holding older data centers for too long of a time period. Investors may also want to limit their exposure to highly improved “turnkey” data centers, where a large portion of the acquisition cost of an asset is represented by improvements beyond a powered base shell. Data centers provide an interesting opportunity for institutional investors to invest in a nascent sector. Investors can benefit from the rapid growth of cloud-based technology while also enjoying the security of a tenant lease that is backed by a real asset. 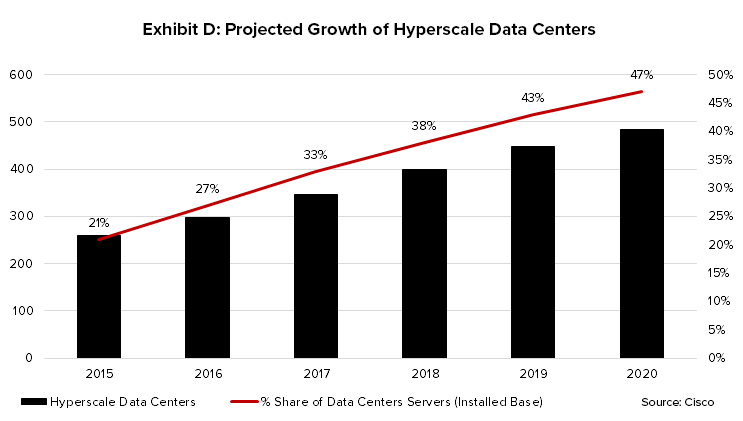 Robust tenant demand, healthy fundamentals, and a development industry that requires a high-level of specialized experience should continue to contribute to the appeal of the data center market. New investment managers and operators are likely to join existing REITs and private equity firms as investor conduits in the data center space. While there are many types of data centers, investors are advised to gain access to this interesting sector through relatively lower-risk options, such as base buildings and powered base buildings. These assets should offer less risk of functional obsolescence over time.